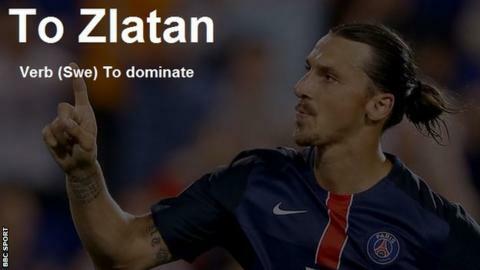 The word "Zlatan" - meaning supreme skill coupled with audacious confidence - has long been part of the football lexicon. How many five-a-side footballers have described their own moment of breathtaking quality as "doing a Zlatan"? Indeed, Ibrahimovic is so good he has his own verb in the Swedish dictionary - "zlatanera", which translates as "to Zlatan" and means "to dominate". But sport is not just sublime beauty and outrageous ego. We asked BBC Sportsday readers to add to our sporting dictionary. Nathan Arnold: "To be Skrtled" - to have your shirt consistently pulled at corners. AJ: "To Liverpool" - to never win the Premier League. Liam McCann: "To Liverpool" - meaning it's our year this year, haha. Steve Ballinger: "To take a Suarez" - ie "He really took a big Suarez out of that burger." Oliver Wicks: "To Istanbul" - to pull off a huge turnaround. "I started this exam badly but in the last 20 minutes I absolutely Istanbuled it". Andrew Barry: "To Liverpool" - to be the pre-eminent and dominant team/person in your sport and then to fade off into mediocrity, while still holding to the delusion that success is just around the corner. And this from a Liverpool fan. Paul Hawkins: "To Villa" - to perpetually disappoint fans and consequently buoy the opposition. Cal Gibson: "To Toon" - to cling onto a 'big club' status while fighting for relegation. See also "to Villa". Mike Sullivan: "To Martinez" - to frustrate immensely by talking only in soundbites ('Phenomenal', 'Unique', Character'). Matt Parry: "To Martinez" - to watch a completely different game to everyone else. James Rooney: "To Martinez" - to underperform whilst having the potential to achieve much more. MIDG 247: "To Wenger" - to try the same thing repeatedly and expect different outcomes. John Gray: "To Wenger" - to say you're going shopping without actually buying anything. Gary Pilkington: "To Wenger" - convincing your bosses you're the man for the job when you're consistently not hitting your targets. Craig: "To Arsenal" - to look on course to pass everything with flying colours, then end up scraping through with a D.
Jamie Davenport: "To Van Gaal" - to disappoint. Alerick: "The Van Gaal" - a philosophy that no-one but yourself understands. Jo: "To Van Gaal" - the act of trusting youths and giving them a chance. Jed Shaw: "To Klopp" - to go crazy when something superb happens. Victor Ekpo: "To Mourinho" - to win without "Zlataning". Josh Jones: "To Leicester" - to perform consistently and unbelievably well, above the standards expected of you, possibly creating history. Mojopin: "To be Spursy" - to promise so much but to perennially fail at the last hurdle. Dan Pattenden: "To Scholesy" - to avoid a booking despite a challenge being so late it is posthumous. Neil Raymond Fulton: "To Thiago" is to absolutely slay a dropping ball with a saucy first touch under intense pressure in the middle of the park. Euan Cowie (suggesting Hibernian are not the most mentally strong team) "Hibsing" - bottling it in a completely catastrophic fashion. Example: "England Hibsed that T20 final pretty hard". Aaran Kendall: "To Boateng someone" - fake a shot resulting in the defender tripping over his own feet. Also to be "Boatenged". Kofi Tawiah Quansah: "To pull a Tevez" - to go on holiday without permission. Matthew Squires: "To Kante" - tackle, mark and break down anything that gets in your half. Josh BW: "To Earnshaw"- To have an amazing goal celebration only to be on the losing side more often than not. Ryan Callanan: "To West Ham" - to bring up the 1966 World Cup as a trophy your club has won by having players in a large squad. Itz Tinny David: "To Ozil" - 1. To assist: Ozil me with your car." 2. To Lend: To Ozil a helping hand to someone. Matt O'Neill: (In tribute to former Manchester City and Middlesbrough midfielder Jamie Pollock) "To Pollock" - score the best goal you'll ever score, alas in the wrong net. Milan Delmelle: "To Torres" - to have both a massive positive impact and a massive bad impact on a game. Ben Morton: "To Payet" - to score a stunning free-kick every single time. Paul Adams: In our billiards and snooker league "to be Nuggeted" - To be utterly crushed! Nickname for Steve Davis in the 80s when he was beating everybody." Read more at #bbcsportsday or on BBC Sport's Facebook page. Quiz: Are these Zlatan quotes real or fake? Read more on Zlatan Ibrahimovic quotes: Real or fake? Can Manchester City overcome PSG? Read more on Champions League: Can Manchester City overcome Paris St-Germain?